1. Season the flour with a pinch of salt and ground black pepper and dust the lamb shanks in the seasoned flour. Heat half the olive oil in a large casserole dish and brown the lamb well all over. Remove from the dish after browning and set aside, add the remaining oil to the pan and cook the onions for a few minutes then add the garlic and rosemary and cook for a minute. Tip in any remaining flour and cook for just a minute. 2. Add the sugar and tomato puree and cook for a minute more then pour in the Ale and stock and bring to a simmer. Return the lamb to the dish and turn down the heat and cover and cook over a very gentle heat for about 21/2 hours until the meat falls apart and the sauce is rich and thickened. 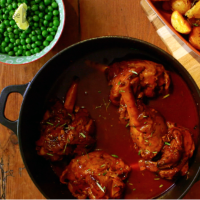 Serve the lamb shanks and sauce with roasted new potatoes, and minted peas and green beans.